The way in which we expand our inner and outer lives is also addressed by the Ninth House. Travel and interaction with other peoples and cultures are a means to this end. Our dreams - those that illustrate our past as well as those that speak to future events - also help to mold our being and our relationships. Taking this a step further, psychics as the bearers of relevant information also come into play. The sign and planetary action in the ninth house shows how your faith in life is restored. The little clues and dramas in this house are the part of the spiritual quest. It defines what gives you that sense that you’re on the right track, following clues on a path of spiritual growth. A strong ninth house gives you an inner awareness that life is rewarding, with the chance for new vistas to see around every corner. It shows how the dots are connected, to make sense of the journey of life. 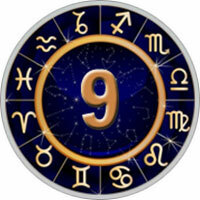 The Ninth House is ruled by Sagittarius and the planet Jupiter.